Samsung Notebook 7 Spin launched: A 3-in-1 convertible laptop with upgradable storage. Most of the time, Samsung’s Laptop launches were buried under the launch of its flagship smartphones.Their laptops never used to get media attention more than a certain extent. But times have changed now. Samsung has launched their new Windows 10 laptop named Samsung Notebook 7 Spin. 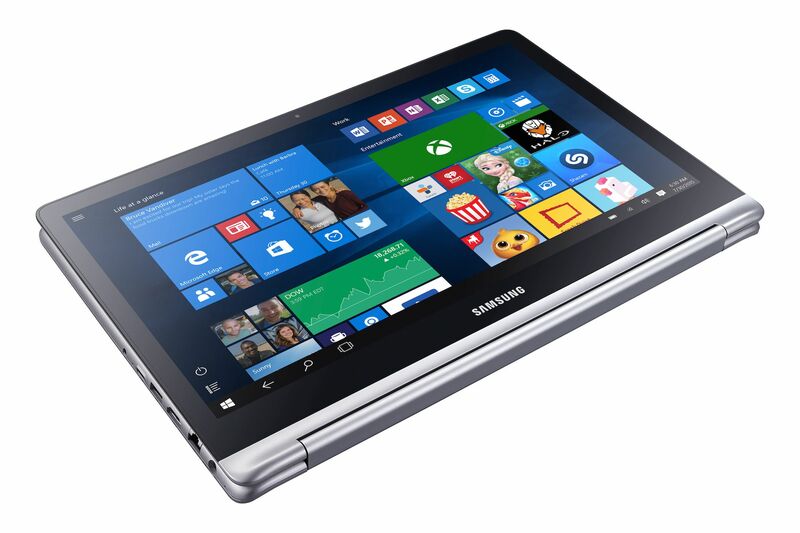 The Samsung Notebook 7 Spin comes in two versions: One with 15.6 inch display & other with 13 inch display. The Samsung N otebook Spin is a powerful machine. It manages to incorporate a 1TB HDD & upto 16GB RAM in its sleek body.The main plus point for it is the upgradable storage options. The Samsung Notebook 7 Spin allows SSD expansion for those who want even more storage.Imagine using an SSD in addition to onboard 1TB HDD, an insanely fast experience will be the result. The Notebook 7 Spin features an i7 or i5 processor based on the screen sizes available. The 15.6 inch will have the i7 & 13 inch has i5 chipset, both are well powered enough to handle gaming & multimedia tasks with ease. In addition, the 15.6 variant also contains Nvidia 940MX Graphics card aimed at serious gamers. In terms of design, Samsung Notebook 7 Spin is a lookalike of Lenovo Yoga series convertible laptops. Like Lenovo Yoga, this is also a convertible laptop. The display can be rotated back to 360° & can be made into a king sized tablet.The design of the device gives it the capability to be used as a traditional laptop, a tablet, or a tent for watching videos. The Notebook 7 Spin comes packed with Windows 10 features: you can use the full HD touchscreen to draw and markup webpages in Microsoft Edge, enjoy your own personal digital assistant in Cortana and access great apps, games, movies and TV shows through the Windows Store. Notebook 7 has a host of connectivity options. It has an ethernet port, a USB 3.0 port, two USB 2.0 ports & a USB-C port for enhanced connectivity. But one thing I noticed is the flaws in design regarding the ports. The USB-C port sticks out of the body & it doesn’t feel to be part of design. It has a top class battery pack that supports Quick Charging technology. Just 20 min of charge can power it for 2 hours, while in 90 minutes its fully powered up.The 13 inch variant can be 100% charged in 100 minutes (ahem, is that 1% in 1min?). The laptop features a full size keyboard with auto-backlit configuration. The light sensor detects the amount of ambience & turns on the keyboard backlight in case of low light. However the touchpad seems to be lacking that distinct response.Not to mention its placement; its aligned towards left & it would be better if it was centered. The highlight feature of this laptop is its Full HD touch screen with Video HDR mode, content is sharper, colors are more vivid and textures truly pop out. Video HDR mode instantly optimizes the video & you get an immersive theatrical experience while watching movies. Overall, its worth buying for the sheer power that it offers & also if you don’t care for the design philosophy. The laptop is priced at ₹52,800($800) for 13 inch variant & ₹ 79,200($1200) for the 15.6 variant. Available via Samsung store & will soon be available in leading online retailers. Previous article Collection of Best Free wallpapers HD:Download!